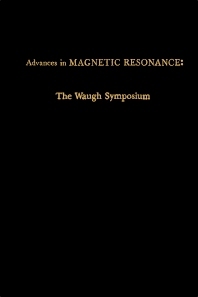 Advances in Magnetic Resonance: The Waugh Symposium, Volume 14 is a collection of manuscripts presented at the 1989 symposium on “High Resolution NMR in Solids”, held at the Massachusetts Institute of Technology. The contributors provide 20- to 30-page articles consistent with AMR’s traditional emphasis on quantitative analysis of NMR techniques. Organized into 13 chapters, this book discusses the principles triple-quantum filtered two-dimensional exchange spectroscopy and its application in the measurement of cross correlation between pairs of dipole-dipole interactions. It then describes alternative ways of using fictitious spin in pulsed nuclear quadrupole resonance or NMR. General topics on the application of optical spectroscopy; the saturation of spin-spin energy by slow continuous bulk rotation; the frequency-switched Lee-Goldburg pulse cycle; and high-resolution proton NMR in solid systems are also explored. A chapter examines an entirely different view of spin dynamics in the presence of radio-frequency fields. This book also deals with the theoretical background and application of solid-state and zero-field NMR spectroscopies to structure determination. Lastly, the utilization of the Floquet formalism in the design of broadband propagators in two-level systems and the two classes of novel NMR phenomena related to the symmetrization postulate are discussed. Analytical and quantum chemists, physicists, biochemists, and materials science researchers will find this book invaluable.